The start of the school year has seen a lot of the “What” thus far. The “What” in the teachers I’ve had the pleasure working with, has fed the “why”, not the other way around. That is, when a teacher facilitates a 3-Act Task, or a Would You Rather?, or a Which One Doesn’t Belong, or a Desmos Activity, or PBL or PrBL Unit, their practice changes as a result of the succeeding reflection. Jo Boaler’s Low Floor / High Ceiling tasks actually start to find and bubble up the cracks in student learning (or in teacher practice). 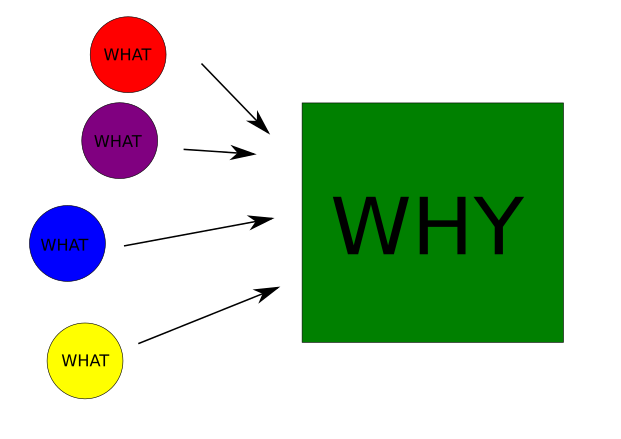 Starting with the “why” feels almost like getting teachers to reflect on something that hasn’t happened yet, or at least the way I clumsily package it. Perhaps even more often, a teacher may be falsely reassured that he/she is attending to the Why if they don’t ever offer a compelling What. A teacher that assigns solely rote problems may never expose the gaps in his/her Why: I want kids to be good problem solvers, and just look at all these problems they’re solving! One of the more successful coaching experiences I had last year was with a teacher I never had the chance to “pre-brief” the Why. She was hired early in the year, but after school had started. And she took the resources and started trying stuff out. It was through the reflection of those facilitation experiences that she grew as an educator. We never talked about the Why around inquiry or student engagement or anything like that. At the end of the year, she was rocking and rolling with Problem Based Learning, using many of the tasks that had been provided and developing some of her own. Early this school year I’ve had the pleasure of seeing teachers implementing a lot of “Whats” and the reflection and feedback has pointed to the Why, rather than the other way around. And when things go poorly we can talk about that as well. Oftentimes it’s when the tasks break that teachers reconsider the inner sections of the Golden Circle (the How and Why). Similarly, the most influential PD activities I’ve participated in or facilitated are those that involve some sort of student work analysis. Once we have a What, we can start to pull apart how it points to (or doesn’t) our Why. Or only then do we start to develop our Why. I love Math Mistakes because the tasks and student work provided elicits conversation about the purpose of mathematics and how we teach it. Does mindset change practice or does practice change mindset? Or does practice change practice? Of course it’s possible that I’m using the lens of my own predisposition to break and try new things. I didn’t really start reconsidering my practice and how I did things until I tried something quite new and foreign to what I’d been doing before. Only after I made a huge mess did I start thinking more deeply about my craft, including the Why. While I’ll probably continue Starting With The Why ™ for my own planning and reflection, I’ll probably ease up on my emphasis about its importance.